Despite a long pause without updates, I haven't been skipping on the reading. Quite the contrary actually. During the past two weeks, I was travelling in the USA, first in New York and then in Washington DC. If you are like me, travelling is the best time to read novels: the long flights and bus rides are the perfect chance to enjoy a good book while viewing the slowly passing landscape (or airspace). Travelling causes a feeling of limbo in me and this has helped me to concentrate and really jump into new books and stories. During the two weeks I not only read Ernest Hemingway's The Sun Also Rises (which is discussed here) but also The Man Who Mistook His Wife for a Hat by Oliver Sacks and Are You Smart Enough to Work at Google? by William Poundstone. As you might guess, these books have nothing in common, and maybe it's better that way - there is a certain beauty to variety. The first time I read The Sun Also Rises, many years ago, I loved it but was also baffled by it. 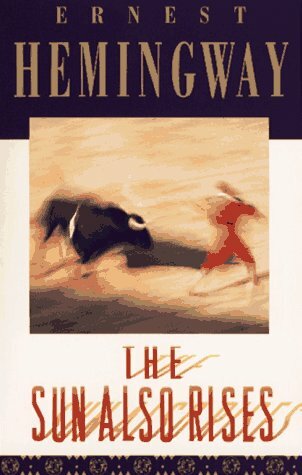 It was the first book by Hemingway that I had read and not being used to the subtle narrative and beginning of the century expatriate culture I also managed to miss some of the key points. Why is Jake Barnes, an American world war I veteran living in Paris, unable to consummate his love for the British Brett Ashley? You'll never know if you don't pay attention to the seemingly mundane dialog. The way Hemingway loves to build the characters relies on unspoken (or barely spoken) gestures. I hear it's called the iceberg theory, and in a way that makes sense; it's a short book with a lot of things going on beneath the surface. What I loved about The Sun Also Rises is the way it depicts people stuck in transit, constantly travelling without actually getting anywhere. Jake's war injury prevents him from having a true relationship with anyone, Robert is hopelessly in love with a woman who he is never to have, Brett, who in turn is unable to commit to only one man. It might sound like a complicated love triangle (which it is on a minor scale), but there is so much more at stake. These unlikely heroes travel from Paris to northern Spain looking for adventure, wine and bull fights, while each embodying some part of the culture of the times. And after all, the sun does also rise, in beautiful, bloody shades of red over the spanish planes with trout swimming upriver and bulls awaiting their turn in the arena.